Use hints and complete quests to earn coins. 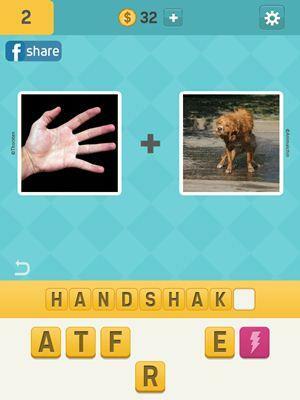 Pictoword is a brilliant word guessing game, perfect for an amazing pastime in your phones. The game features a unique concept of guessing the word from pictures. With a huge variety of increasing challenging levels, test your vocabulary in this epic game. The game play is quite genius and simple that keeps the game addicting and better than other word guessing games. 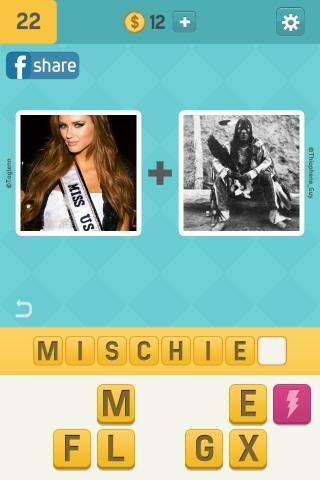 You have to guess a word by two pictures as the word to be guessed is a combination of what the pictures are portraying. The letters are available and you can just tap them to select them and make a word. An undo button is also present that can remove all the selected words in an instant. Pictoword features a huge variety of different levels in which you will have to guess a new word using the two pictures. You can only move on to the next level when you rightly guess the previous word. The levels progressively get a bit more challenging that keeps the game addicting. Each level you complete will earn you coins that can be used in the game later on. You can also purchase more coins if you are running low by purchasing them through real cash via secured payment methods. 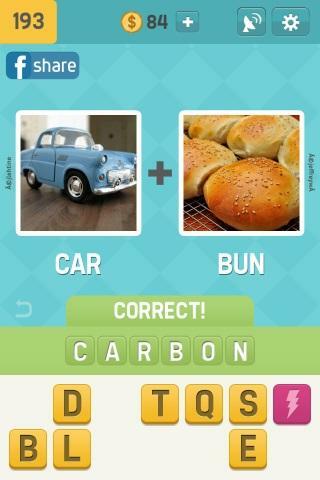 If the level is too hard for you to guess the word, you can always take care of the hints. Remove a letter from the available ones or reveal one from the word to be guessed. Reveal the word belonging to the first photo or the other one; you can use all these hints at the cost of a few coins that can be earned through completing the levels in the game. You can also shuffle the available letters in hope of getting them arranged in the correct order to be used. Another great way of earning coins is through quests that can be completed in an instant. These include guessing 5 puzzles in a row, playing the game for three days straight and much more. Once completed, you are awarded with free coins in the game that can prove quite useful in the game. You can also send the puzzle to your friends at various social media platforms and ask them for an answer to avoid spending coins on the hints available. The game also includes various theme packs that you will have to unlock by leveling up in the game. These theme packs give the game a pretty awesome look and make it more interesting. Pictoword features a really great and user friendly interface that makes the game look quite elegant. The graphics are on point along with amazing sound effects and background tunes. It really is the complete package of entertainment that you have been searching for. Guess the right word from a combination of two pictures. Play a huge variety of exciting and challenging levels. Use hints or ask your friends for the correct answer. Enjoy cool theme packs as you level up. Try out You can also purchase more coins if you are running low by purchasing them through real cash via secured payment methods. Try out Pictoword today.